HONG KONG—Chinese telecoms equipment maker ZTE Corp expects to post a loss of up to 7.2 billion yuan for the full year, despite a third-quarter net profit of 564 million yuan ($81 million) after resuming business in the wake of crippling U.S. sanctions. Profit in the three months to Sept. 30 was down 65 percent year on year, while revenue dropped by 14.3 percent to 19.33 billion, the company said on Oct. 25. In its Thursday filing, ZTE said it expects to make a loss of between 6.2 billion and 7.2 billion yuan for full-year 2018, compared with a profit of 4.57 billion in 2017. 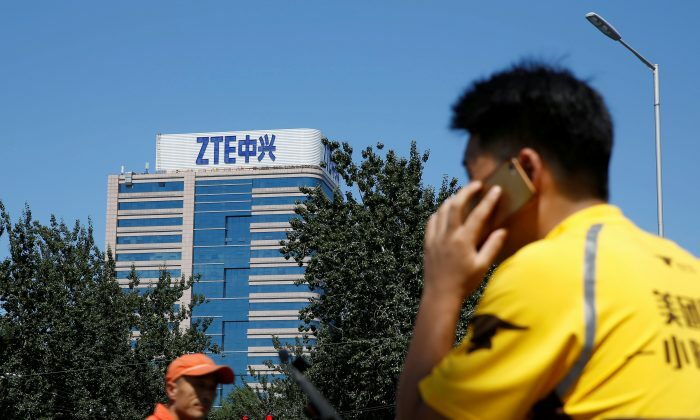 On Oct. 3, a U.S. judge issued an order finding that China‘s ZTE Corp violated probation imposed in March 2017 when the company pleaded guilty for conspiring to evade U.S. sanctions by illegally shipping U.S. goods and technology to Iran. In his order, U.S. District Judge Ed Kinkeade in Dallas extended until 2022 the term of a monitor he appointed to assess ZTE’s compliance with U.S. export control law. ZTE was forced to stop most business operations between April and July, when it paid $1.4 billion in penalties to lift the sanctions. Lawmakers have introduced several pieces of legislation since Trump lifted the ban in July that seek to clamp down on the company. But most have failed to advance in the face of administration opposition. Many members of Congress view the Chinese firm as a national security threat, worrying that the use of its technology in the United States could make it easier for China to steal secrets. By Sijia Jiang. The Epoch Times staff contributed to this report.